The San Jose Blog: San Jose Greek Festival this Weekend! San Jose Greek Festival this Weekend! One of the largest ethnic festivals in the South Bay is going down this weekend, and we have a free pass for you! The San Jose Greek Festival is a celebration of Greek food, music, and culture and takes place outside St. Nicholas Greek Orthodox Church at 1260 Davis Street. The event actually runs three whole days starting this Friday. There are a couple of new food items this year, including a vegetarian gyro. 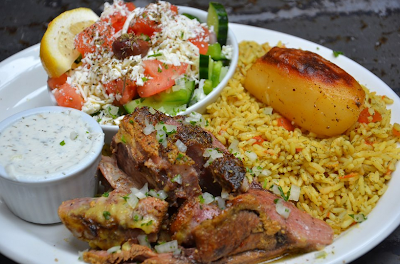 Greek is not always the most vegetarian-friendly cuisine around, but rest assured you will have some great options this year if you don't eat meat. For those that do, you can never go wrong with the lamb! Another new item this year is an olive medley that will be served at the Greek wine and cheese booth. -Chick-Fil-A is coming to the San Jose Market Center (on Coleman) and is currently in design review. Forgot to add that Smashburger is also opening at the Market Center. Bonchon and Pieology will be opening at Brokaw Commons. Do you have any more info or links on Sajj, Chick-Fil-A, or the Brokaw Commons places? Chick-Fil-A was mentioned during the DTSJ real estate tour at the start of May.